Everyday Observations #2: Scissors & Ball. 1/17/19. Digital Pastel, 12×20″ @300dpi. Some of you may have already seen a short video I shared, on Instagram, showing some of the techniques I used. This is #2 in a just started, ongoing series of everyday observations. They are realistic renderings of photos I take of my environment. The subjects aren’t supposed to be dramatic, but are studies of light, shading, form, perspective, texture, modeling, and so on. I can explain it better with another picture, #1 from the series. Between the two I think you’ll get the idea without recourse to verbiage. Let’s see those side by side. I think they complement each other well, and are departure from my more standard fare (not that my fare is at all standard). I like doing these a lot, and they are a challenge, but because they are so subordinate to things as they appear, I don’t consider them my most evolved art. There isn’t that much for my imagination to do here. Rather, these are exercises to improve my observational skills and ability to depict realistic modeling, textures, etc…. That said, I do respect realists work because there’s an element of bending one’s mind and wrist to how things are independent of oneself. It’s a kind of wrangling with reality. I wrote an article on Robert Bechtle before. He features 60’s and 70’s cars in his art. So, you could say I’m a soft touch for realism. Robert Bechtle. 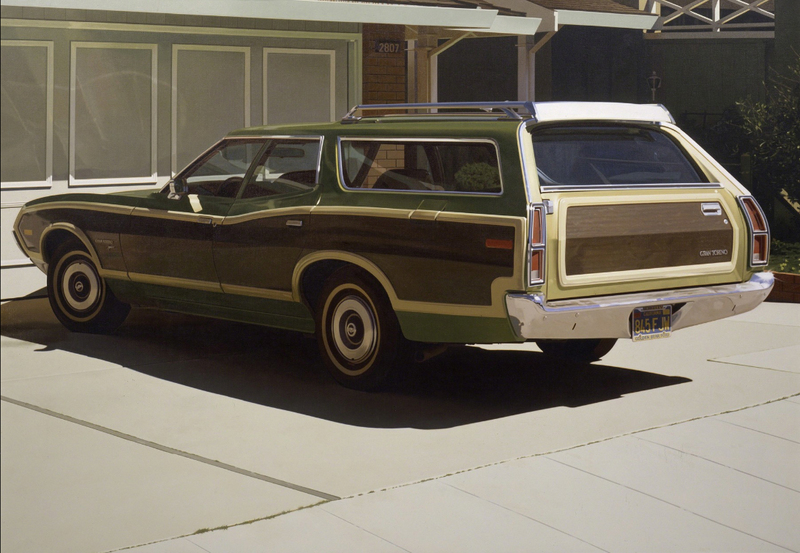 ‘Alameda Gran Torino’ 1974. 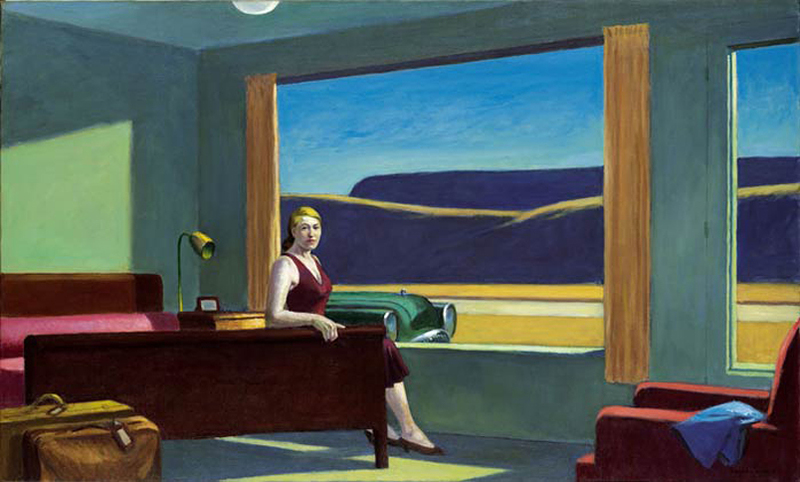 Bechtle, in turn, comes out of the tradition of Edward Hopper. Notice the car coming out of the woman’s stomach. I’m sure Bechtle is a fan, but he works even more realistically. Hopper put humans in his paintings — human and environment — but everything is painted the same way, which appears deceptively simple, which is its appeal. If you look at the back wall in the painting above, that giant green triangle is one of the most important elements of the painting. For this series, so far, my process is modestly direct. I edit and crop my photo, then place is side-by-side with a blank canvas, in Photoshop, and they start copying away. I don’t make a tracing! These are more about the process than the end result. In this case cheating would defeat the purpose. I can, however, work in layers, which is just smart. So, I made the ball shape first. After doing the ball, I made the striations, which were much harder than one would think. The angles are subtle, and they don’t match, by the way. I want it accurate, but not perfect. It needs to be an interpretation to some degree. And this reminds me, you may have seen those super-intricate portraits people like to do, where every strand of hair is delineated, and maybe the person was photographed with milk or water poured over her, etc. In those cases, the artist uses a grid system, or better yet a projector, to get all the outlines in the right place. Basically, anyone, even a non-artist could do that with a little practice. Doing that doesn’t help you learn perspective, lighting, and the whole package, even if the tediously achieved results WOW the average Instagram image-flicker. Here’s an early stage with the scissors, and you can see I’m just eye-balling it. Note I can flip the canvas horizontally to work on it backwards. Sometimes you can see something more clearly that way. One of my artist friends confided that he will hold a painting up in the mirror for the same reason. I tried to use logic, and failed. I needed the right shape ellipse, at the right angle, and intersecting properly with the ball. Looks easy, but itsn’t at all. Here are some images of sections zoomed in to “actual pixels”. I chose this photo because of the challenging angles and shapes, but also because I would need to render metal, plastic, and rubber. Doing the lettering was a Pin the A, but the bolt, or whatever it is, was pure fun. These striations on the blade of the scissors weren’t too hard once I figured out a technique. Here I held “shift” to get straight lines in PS. The tip of the scissors had a scrap of something stuck in it. 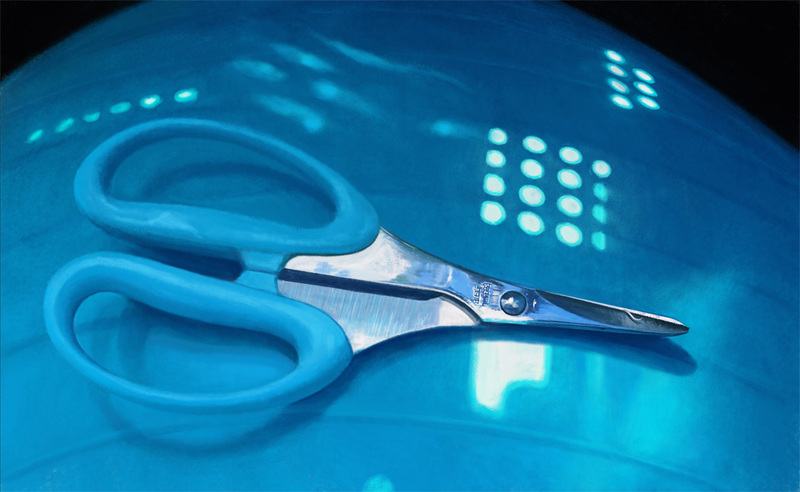 The original inspiration was that the scissors and the ball were the same color, but different forms and textures. Close up you can see the pastel texture. This style has a lot of the virtues of traditional pastel (OK, all of them 🙂 ), but can be combined with photo-editing techniques for more power. More lights. Notice the, uh, penumbra of light around them. The caffeine is wearing off. Time to end this post. If you like my aliens and more imaginative stuff better, one of those will be rolled out soon. If you haven’t seen the post about the first image in this series, here it is. Posted in art, digital art, Everyday ObservationsTagged art, contemporary art, digital art, painting, realism, still lifeBookmark the permalink.